A LIGHTHARTED look at the country's best assets, but with a serious message, the next series of Peter Konrad's television show will feature the Bundaberg region. Pete the Surfaroo is the brainchild of Konrad, a larrikin lifesaver who spent the week filming his adventures through the region, including a day trip to Lady Musgrave Island. "I went out on the boat for the day, did some snorkelling, got up close with the turtles and there were some manta rays out there," he said. "Then we did some whale watching and had mum with a little baby next to us for about two hours circling us." 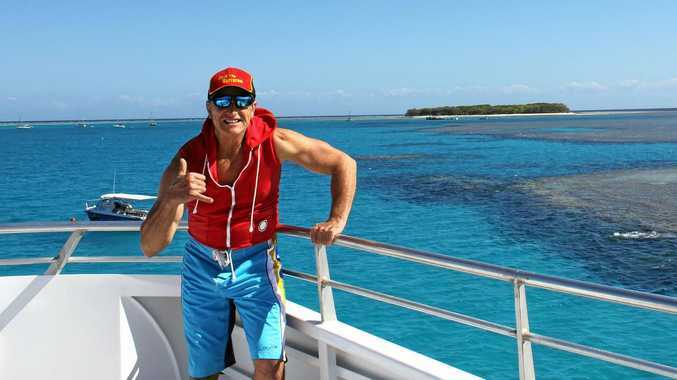 A Gold Coast lifesaver, Konrad said he was right into health, fitness and healthy eating and the message he promoted via the show was to "get out there and see the great outdoors". "Australia's great, I go to all the events, I met and interviewed heaps of celebs while they've been out here," he said. "I'm this crazy character, I'm out there and just show people to get into it and do it." Konrad said while Lady Musgrave was the highlight of the trip, Bargara was also fantastic. "It's so relaxing but there's so much to do," he said. "You can't stay home you just have to get out there and see everything." Up at 5am for a run along the soft sand of Kellys Beach followed by a swim and breakfast at a Bargara cafe, Konrad said he couldn't recommend the region enough. "On the show I just say 'this is one of the places you've got to go'," he said. "It's hidden away, I didn't know abut it before and the only way I found out about it was I wanted to do a story about turtles and Bargara came up. "I found this little town town nestled away and said 'Wow, this it the a place I've got to go'." Konrad said he first visited Bargara in March to talk to the rangers at Mon Repos and this was his second trip in six months. "I went up to the Hummock and I'm going to Barolin Rocks but my favourite place would have to be Lady Musgrave for sure," he said. "We walked on the island and saw the native wildlife," he said. "Then we snorkelled and the coral and marine wildlife is just so good. "Travelling is my passion, and seeing different locations and getting out there." Konrad has wrapped up filming the sixth series of Pete the Surfaroo, which is shown on YouTube and Foxtel.